This site is for all those who, like us, are interested in modern technology in learning and in particular on-line courses. First of all, we have done this project for ourselves - to make an easy and convenient guide to a variety of existing online courses, to have a common directory, not just a dozen separate ones, to keep abreast of all new things, without having to search a huge number of sites daily in order to find a relevant course. This site is just the beginning of the project and it will be constantly developing as the whole online learning area itself (together with, as we hope, education in the XXI century in general). Stay tuned and do not hesitate to contact us if you want to share your ideas. There is a special facebook group for the project announcements and conversations concerning the future of education. You are welcome here with your ideas and questions. We have a Telegram bot as well. It helps you to find courses of your interest. Ask our bot a query and it will find the most relevant courses. The bot is still young and will develop its capabilities. If you have an interesting idea or need some specific functionality, feel free to contact us. Finished MIEM (Moscow state institute of electronics and mathematics, now part of the Higher School of Economics) in 2002, earned PhD in 2006 (in the field of artificial intelligence for using genetic algorithms to train hidden markov models in speech recognition systems). Successfully finished School of bioinformatics in 2013 (former Yandex School of data analysis, faculty of bioinformatics). Software engineer with more than 20 years programming experience. Started programming with machine codes in a notebook then went through Assembler z80, x86, Basic, Pascal, Fortran, Prolog, C, C++, Perl, Python, Ruby, Lisp, Erlang, Haskell, Scala, R, Matlab. Did automatisation, system administration, project and product management. He worked in various fields (medicine, insurance, realty estate, exchange trade, internet, education, entertainment, media, legal practise). 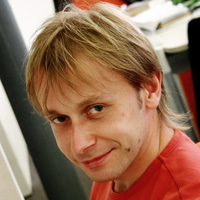 More than 5 years actively participated in the Yandex.News development and was a team leader. Gave lectures in “Introduction to digital signal processing” course, led students engaged on degree thesis, mentored students, participated in sub-faculty research and development projects. Grigory has a solid understanding of the field of online education, treats current situation in education as a revolution and the new era coming. Successfully finished more than 70 MOOCs himself (at Coursera, edX, Udacity, Complexity Explorer, …), many of them with distinction. He is in friends with mathematics, physics, biology, cognitive science and data science. Entirely convinced of the necessity to learn lifelong and not to mark time. Believes that modern technologies can significantly increase the quality of life and help everyone to fully develop their own potential. He is eager to work on projects that make the world better. He repeatedly makes speeches on topics related to education (Future Biotech winter school, school of Vladimir Potanin's Foundation, TEDxPokrovkaSt, EdCrunch).